Over the years we've used Asian Teriyaki Sauce in a hundred different ways especially in the barbecue business. Most of my friends at one time or another have purchased teriyaki sauce from some purveyor. So to make things easier we've decided to produce the recipe we commonly use to give our meats that decidedly Asian Hawaiian flavor. The process is quick and easy and relatively painless. Most people can make this recipe right in their kitchens probably without having to head to the market. So, follow this recipe to see how we do it. As for just plain old easiness I've added our video on making the sauce to this website. So, let's get started. 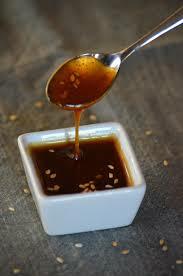 For our Asian Teriyaki Sauce let's assemble all the ingredients necessary to make this wonderful sauce. Mix thoroughly and let rest in a sealed container for about 2 hours to mature. Recipe can be rested in a container overnight which will improve the blending and maturity of the flavors. If you desire a thicker sauce you can bring the ingredients to boil in a container on your stove then quickly reduce the heat to simmer until you've achieved the desired thickness. As we said this ingredient process is easy and the results are fantastic. To marinate effectively allow the sauce to marinate on meat for at least two hours. You can also leave the meat sealed in a container overnight which will allow the sauce marinade to further do its job. Keep in mind after marinating always discard the marinade and do not reuse.